The multimedia centre of the International Choreographic Arts Centre (ICK) in Amsterdam is situated in the Talentenhuis in Nieuw-West, where ICK also has its studios and offices. Publications, videos and websites that have served as inspiration for the performances and activities of ICK can be read and watched here. There’s a specialized collection of reference works and magazines on contemporary dance, with a focus on transfer, (dance) notation and dance dramaturgy. 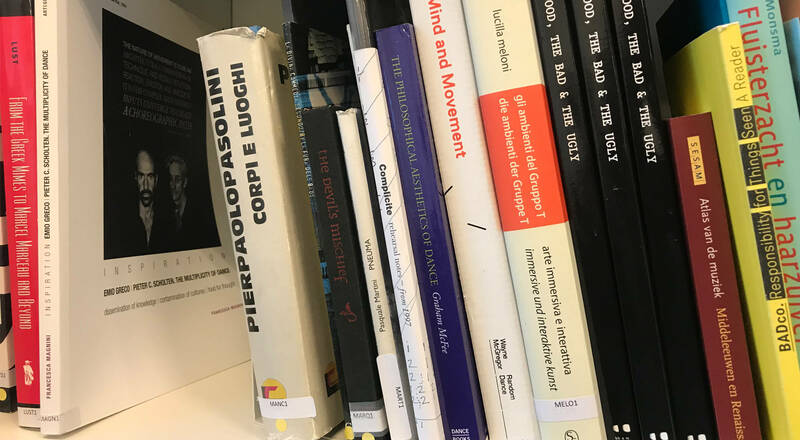 The multimedia centre also opens up a versatile archive of physical and online publications, built up from the artistic practice of the choreographers and researchers working at ICK. The artistic archive of the founders of ICK, choreographers Emio Greco and Pieter C. Scholten is being made available to the public. On request, video registrations and performances may be watched, reviews read and the extensive collection of photographic materials on their repertoire perused. The multimedia centre is free of charge for everyone who is interested in dance. After applying you will get an introduction to the various possibilities of the media centre and you can use the study area. Materials are not lent out, but photocopies can be made at charge. The multimedia centre is located on the second floor of the Talentenhuis (ICK office), Meer en Vaart 290 in Amsterdam. Please contact us to make your first appointment for a visit or to consult the archive at mediatheek@ickamsterdam.nl.